Rishikul Yogshala is all set to host its signature yoga classes in the Garden City – Bangalore, India. The classes shall be conducted in coalition with iRelief Services, a leading facilitator of healthcare services in Bangalore. This alliance is a humble initiative to help as many people transform into healthy beings through the eternal route of Yoga. Acknowledging the passion and dedication with which the iRelief organization works towards assimilating and reaching out the best and prompt health care services to serve the people of the city, Rishikul Yogshala decided to take a step forward in the same direction and a humble liaison took place in the form of Yoga Classes in Bangalore. For the welfare of the city and its people, Rishikul Yogshala has come forward hand-in-hand with the iRelief services to help the people of this cosmopolitan city restore their health and wellness by reaping the humungous benefits of Yoga. Not everyone can free up enough space in life to take a yoga hiatus for months on end. Truth be told, even one month of Yoga Teacher Training mostly happens only for the privileged. The scope of training and excelling in yoga for the urban Indian seems depressingly less, but is it really? 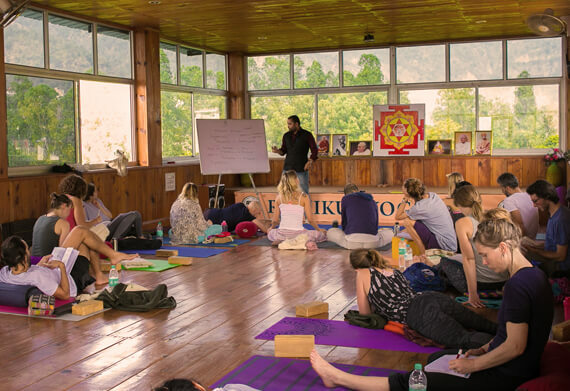 Rishikul Yogshala organizes yoga classes in Bangalore with a systematic curriculum to help the enthusiasts establish a long-standing self-practice and prepare for advanced learning in the field. There are numberless advantages of opting for daily classes—classes are available near you, you may continue or discontinue training as per your suitability, it’s friendlier financially, and most importantly, it won’t take more than a couple of hours of your time. You can easily enroll at our Bangalore yoga centre for daily classes without breaking your professional schedule in India’s famed IT City. The classes are conducted in association with iRelief Services, a leading facilitator of healthcare services in the city. This association is a humble initiative to help as many people become healthy and robust through the route of Yoga. What’s more? Yoga has proven exceptionally beneficial today for physically and psychologically sustaining the demanding life of a metropolis. It’s time for the Bangalore professionals to integrate yoga with their work and personal life and make the city culture holistically healthy. Fitness enthusiasts today choose yoga and a holistic, sustaining health routine over the backbreaking exercise of the gym. The nurturing, restorative, and often therapeutic effects of yoga are well-recognized even in the modern medicine. In the highly demanding metropolis culture of major cities, we need yoga to sustain us through multiple challenges posed on different fronts. Also, between the tug and pull of success and failures of professional life, commitment to family, and relationships, there is a great need for a quality me-time. This is the gap daily sessions with yoga-meditation can fill up, helping you step out of class feeling healthy, in balance, and innately joyful. 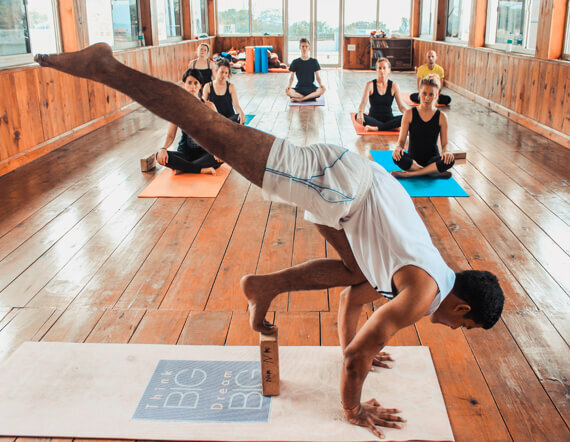 Enrolling in yoga classes Bangalore will help meet the necessary health goals and fulfill the conditions of balance and psychological well-being to the fullest. The aspect of asana in yoga provides massage, de-stressing, and oxygenation of the muscular-skeletal frame, restoring ease in movement. Intensified yogic breath-work or Pranayama brings inner purification. Meditation leads one deeper into self-inquiry. Lastly, the orientation and initiation to yogic philosophy help one think above one’s basic instincts and realize the spiritual truth of life. We, as the best yoga studio in Bangalore, are sure to bring you an experience of these diverse aspects of the yogic thought and lifestyle. Also, enrolling in daily classes in the city could be only just the beginning. As you grow and evolve with the discipline, many doors ought to open in terms of vocation and career. You can register as a yoga teacher after graduating a Yoga Teacher Training from a Yoga Alliance affiliated institute or go on to open new yoga learning facilities, be a one-of-a-kind ‘Entrepreneur’ Yogi. 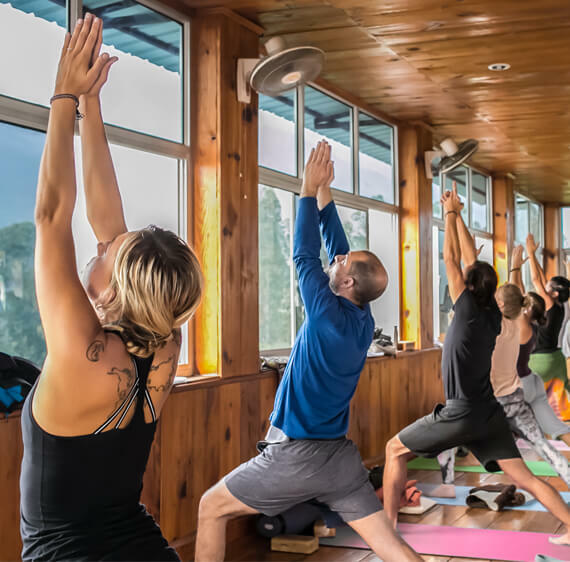 Ashtanga Yoga, the legacy of modern-day yoga luminaries like Sri Pattabhi Jois and BKS Iyengar follows from an unbroken thread of great wisdom since the Vedic Age. The ashta-marga or eightfold path, as defined in the Ashtanga tenets emphasize the importance of— moral conduct, spiritual observances, contemplation, posture, control of prana or life-energy, withdrawal or non-attachment to sensory pleasures, focus, meditation, and the final attainment of super-consciousness. Ashtanga Yoga thus opens up a whole new dimension to yoga, taking the discipline beyond designated hours on the mat. The asana style of the Ashtanga School is well-known for the exacting levels of challenge, unique breath-work integration with movement, and the very characteristic vinyasa, or uninterrupted flow-style movement. Long been established as the popular choice for yogis who like it intense and challenging, Ashtanga is now the main feature at our yoga classes in Bangalore. On dedicatedly attending Ashtanga at our Yoga classes in Bangalore, you will be prepared with the exceptional skill of seamless vinyasa posture performance. Achieving breath-movement integration in the flow style of authentic vinyasa is a definite stepping stone in one’s yogic practice. Hatha Yoga refers to a foundational style or school of yoga which also literally translates as ‘force’. Hatha is known to concern all aspects of yoga that relate to physical movement, meaning all asanas are fundamentally Hatha. The spiritual connotation of the term, however, refers to a coming together of different energies, like the Congress of the ‘sun’ and the ‘moon’. Hatha Yoga is, therefore, an ennobling spiritual practice in essence that concerns physical exercise or asana to prepare the body-mind for higher levels of consciousness. Hatha movements are distinctively different from the more rigorous Ashtanga style. In this yoga, you will be performing slow, contemplative asanas with an enhancing awareness of the element of ‘breath’. The Meditative inquiry is another integral part of the Hatha discipline. At our yoga classes in Bangalore, you will receive training in the beginner, intermediate, and advanced series of Hatha Yoga. Hands-on assistance, correction of posture, and meditative orientation from our experienced teachers will complete this initiation. 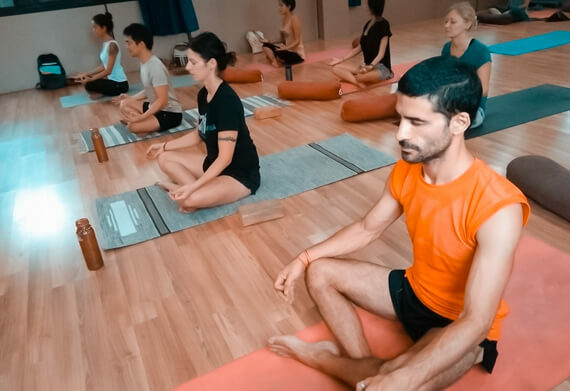 Unlike the half-baked approach of many other schools, Rishikul Yogshala believes in imbibing a complete sense of yoga, even in the daily-hourly class format. Therefore, we have Yoga Philosophy forming a major part of our offered classes. Explore the significance of yogic tenets through the detailed reading of the discipline’s seminal texts like The Yoga Sutras of Patanjali, Hatha Yoga Pradipika, Hatha Ratnavali, Siva Samhita and others from the ancient canon, and the works of 20-21st century yoga luminaries like Pattabhi Jois’ ‘Yoga Mala’ and B.K.S. Iyengar’s ‘Light On Yoga’. Selected readings will be paraphrased and discussed, debated, and commented upon at our interactive sessions on Yoga History and Philosophy. An often quoted excerpt from the great sage Patanjali’s Yoga Sutra—‘Yoga Chitta Vritti Nirodha’ defines the spiritual purpose of practicing meditation. Meditative inquiry and practice ceases the mind’s chatter, deflects the illusions of the universe, and takes one closer to the Truth. 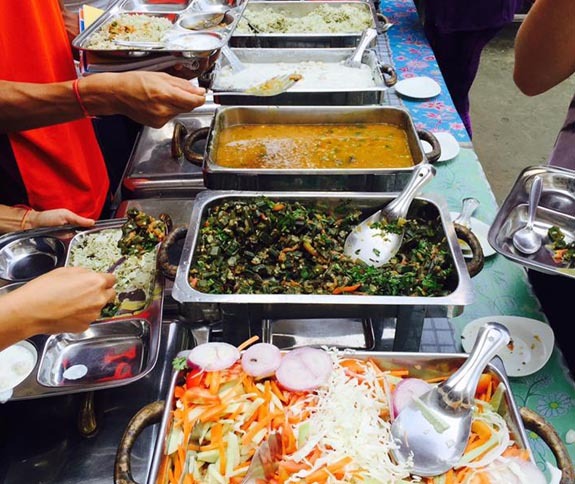 The discernable practical benefits of the practice are as many. Longtime meditation practitioners confirm that mindfulness practice hones one’s ‘soft skills’—concentration, problem-solving aptitude, interpersonal behavior, effective stress managing capacity, leadership, quality and productivity, and positive outlook. 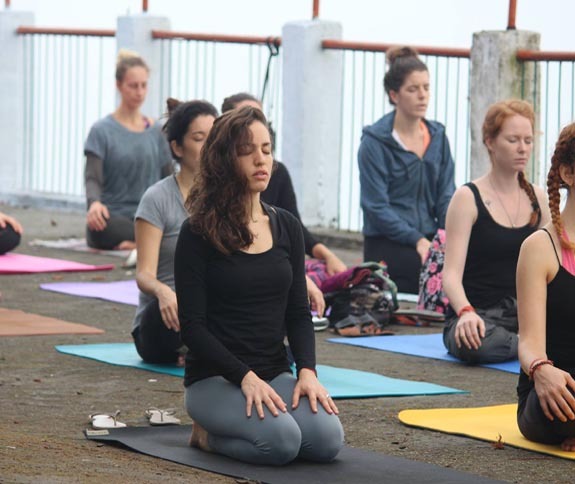 On taking our yoga classes in Bangalore you are going to learn the art of meditation with techniques like— Yoga Nidra, Chakra Meditation, Osho Meditation or Dance Meditation, Trataka, Visualization, and various other ways, welcoming you into a world of contentment and inner bliss. There are more to our contribution to the field of yoga learning than the above-mentioned classes. Our other classes include special sessions on different topics relating to yoga and holistic wellness. Keep an eye on our social media portals to be notified of about these exclusive classes. You can also request special classes with us. We require a minimum of five members to take a group class request. For more information, call or drop by at the front desk.